I had purchased a Yaesu FT-875D radio and ATAS-120A antenna in 2007. The ATAS-120 is an antenna designed to be used with the FT-857. It can be tuned to any frequency in the 40 through 6 meter bands from the car by simply tuning the rig to the desired frequency and pressing a tune button on the 857. I wanted to install them in our cars but did not want to mount the antenna on the bumper or trunk lid. So, I dusted off a Tri magnetic mount that I had been using with an old Hustler antenna. But a trip to Florida was being planned and I wanted a mount with more holding strength than the old Tri-Mag mount would provide for the higher highway speeds. We have two cars and I wanted to be able to mount the antenna on each of them. 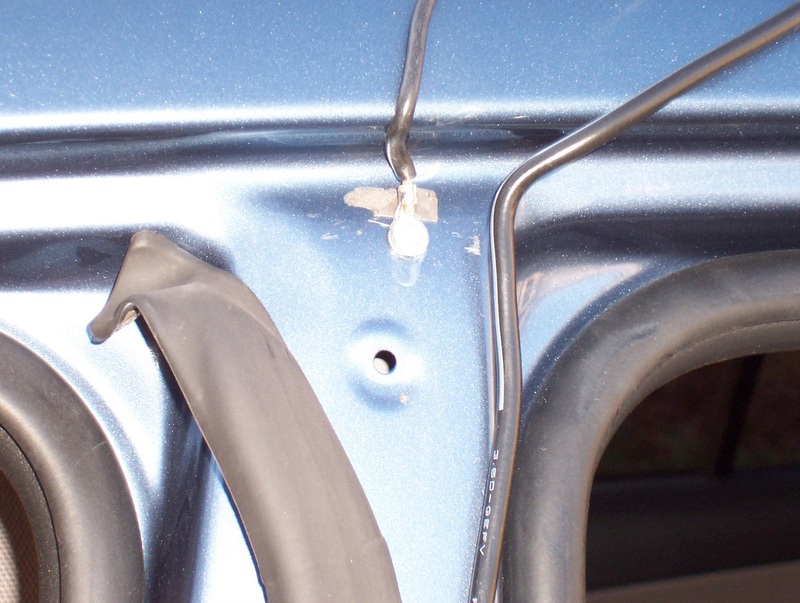 The owners manual said “magnet mounts do not provide the RF grounding necessary for good performance, and are not recommended for use with this antenna.” To overcome this defect, I ran a ground wire from each magnet connecting bar to each side of the body of the car at the roof line. The vertical rubber gasket between the doors was able to be pushed aside just enough to drill a hole for a sheet metal screw, which was then invisible when the gasket was relaxed to its normal shape. I scraped the paint around the hole to insure a good contact. Because this involved drilling a hole for the ground screw, I had to get my XYL's permission before drilling on her car. Her initial reaction was “drilling holes in my new car, no way” When I showed her where the holes would be, and that they would not be visible, she said “OK”. When the vehicles are sold the screws will not be visible. The coax cable was run along the rubber gasket into the car. Never had any water leakage! I purchased a quad magnet mount. When the magnet mount arrived it was in a plastic bag. First thing that I did was cut circles of plastic/Saran wrap for each magnet and placed them on immediately to keep debris off the magnets. I am a firm believer in Murphy’s Law (ML) that says any scrap of metal, no matter how small, will be attracted to the magnets and will be impossible to get off, and will mar the car's roof. I anticipated a potential problem with the strong magnets and my watch so I took my wrist watch off when working with the mounts.However, I made the mistake of placing the magnet mount on an old metal projector table and had to take the cross bars off in order to get the magnets off the table individually. OK, so I am almost age 70 and not Charles Atlas. Each magnet has 200lbs of attractive force. With four magnets, that’s 800lbs of holding power. CAUTION: Do not get your fingers in the way! I felt the cross bar between each set of magnets was not large enough for the hole for the SO-239. I purchased a coax cable with a long barrel, 1 inch, SO-239 on one end with the coax at right angles and PL-259 on the other end. This gives a very strong base for the ATAS antenna. I had a machine shop drill a 5/8² hole in a piece of aluminum stock, 11² long, 1 ½² wide and 3/8² thick. If you have a machine shop drill the hole be sure to take the connector with you to be sure it fits. (ML) The bar that came with the mount was just 8² long and 1/4² thick with two small holes for screws going into the base of the mount. I did not use it as I felt the screws would not be strong enough. The bottom of the ATAS has two slots for an open end wrench but they are too narrow for a standard wrench. I had the machine shop make one as I wanted to be able to tighten the antenna beyond just using my hands. When the antenna is not on the magnetic mount be sure to put the weather cap on the SO-239 to keep the water out. ML says you are going to lose it so get some spares at the hardware store. For the rig, I pulled the carpet aside under the dash board and found a bolt that I could back out and I used it for a ground attachment to the rig. I used the threaded holes in the rig that the mounting bracket would be used for. If you attach the mounting bracket, MMB-82 to the dash board be sure to run a ground as many dash boards are mostly PLASTIC!! 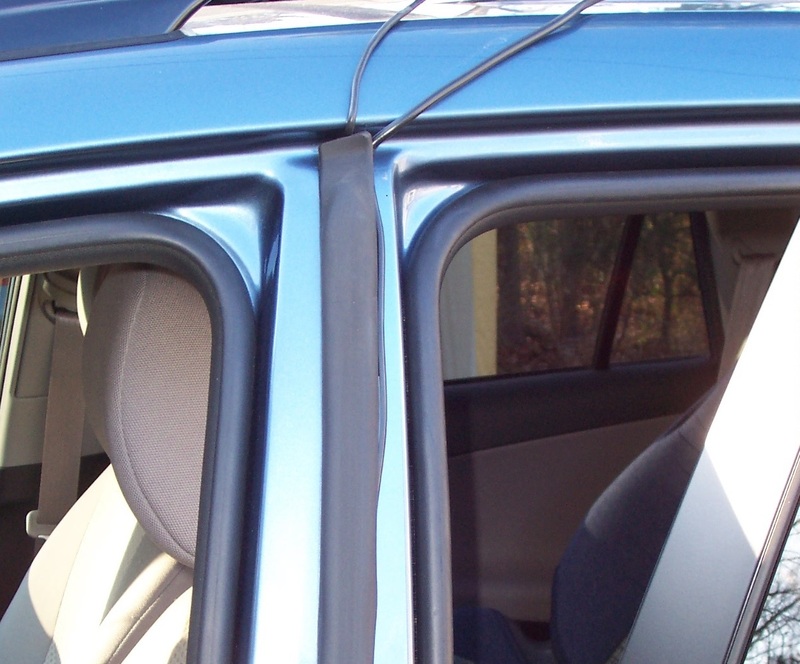 The XYL’s car is a 2008 Toyota RAV-4 which has ridges on the roof running front to back. My car is a 2004 Dodge Neon and has a smooth but curved room. To ensure proper fit-up for the XTL's car, I placed a large piece of paper on the floor and traced around each magnet then placed the paper on the roof to get the position between the ridges. I then separate the magnets, two and two, with the connecting cross bar attached to one side only, using that for a handle. Astep ladder was necessary to get into the best position and have enough height for the installation. I suggest that you have someone to help. I put the SO-239 in the cross bar 5/8² hole while the magnet pair was separated. This is necessary becuse there is NOT enough room to slide it in from under the connecting bar once the magnets are in place! I placed one set of magnets EDGE down and then lowered the pair to the vehicle roof. The fun part was getting the other pair of magnets down without my fingers being shortened. I had reversed the bolts so that the heads were down, closest to the roof, and the nuts were attached from above. That way the socket wrench would work the nuts from above and an open end wrench would hold the bolt in place from underneath, next to the roof. After getting the 2nd set of magnets in the proper position, the cross bar from the first pair of magnets was reattached to the 2nd set of magnets. 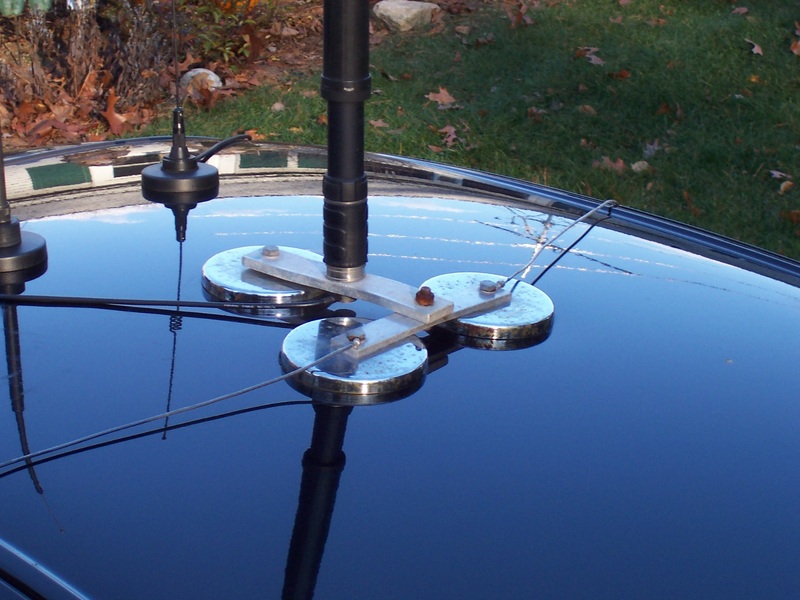 I use the Tri Magnet mount for my car with the smooth but curved roof. 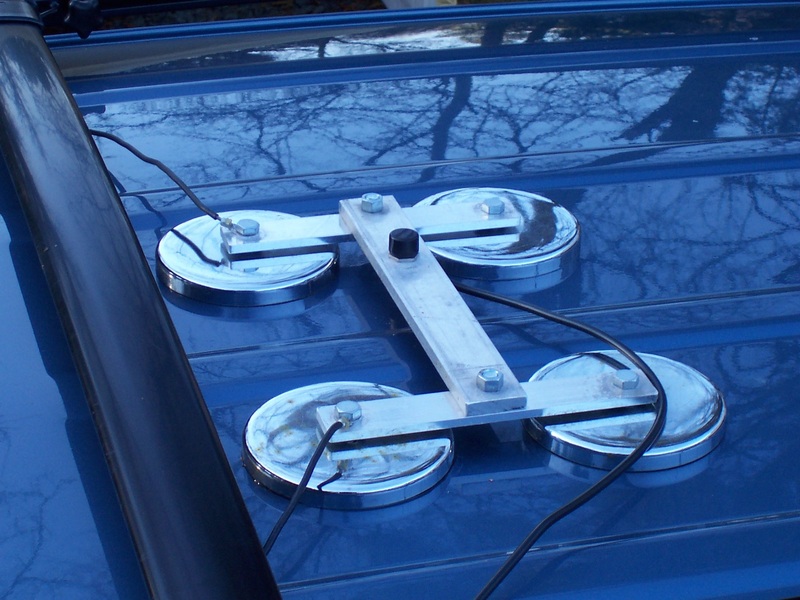 Because each magnet has to sit flatly on the roof, it was necessary to bend the cross bar between the magnets to accomodate the roof's curvature. The machine shop bent the cross bar for me. The quad magnet mount was on the roof with the ATAS -120A antenna and the Yaesu on the dash board. I went on a test drive on I-91 through Hartford. There was a pileup on 17mtrs so I threw my call in and 4X4FR came back with a 5-9, thanks Rafi. The trip to Florida was flawless as the ATAS was tuned from 40mtrs to 6mtrs with perfect SWR. Contacts were made on all the bands with very good signal reports. The speed limit for most of the trip was 70 mph and keeping up with traffic was 80mph. That’s a lot of wind force on the ATAS antenna. The magnet mount did not move at all, even under these forces, and the antenna automatically tuned from one band to another without a problem. Keep an eye on the weather as a 20mph head wind could add up to 100mph of force on the antenna if you are at 80mph! When we stayed at a motel the ATAS was removed from the magnet mount and the rig from the dash board and taken inside for the night. A consequence of a roof mounted variable length antenna is that the antenna will hit low objects. We adjusted our driving habits to avoid drive throughs with roofs and mostly parked in open parking lots. Suggest you tune the ATAS to 40mtrs (the antenna is at its maximum height on 40 meters) and measure how high theheight of the antenna so that you'll know what clearances you need. Keep an eye on tree limbs, power lines and bridges. While the whip at the upper portion of the ATAS-120 is flexible and can tolerate being bent back by low objects, having a low object hit the fixed body of the ATAS antenna would be disasterous. I am more than satisfied with the performance of the ATAS and magnet mount. Suspect the radiation pattern is better than having the antenna mounted on the trunk or rear bumper. I feel other motorized antennas could be adapted to fit the magnet mount. W1FTE got his license 5-24-1955, has an Extra license and is active on all bands from home and mobile. He is retired, is a Tour Guide at the ARRL every Tuesday, and advocates every ham to come to "Mecca' when in the area.